"A saint is not to take the initiative toward self-realization, but toward knowing Jesus Christ. A spiritually vigorous saint never believes that his circumstances simply happen at random, nor does he ever think of his life as being divided into the secular and the sacred. He sees every situation in which he finds himself as the means of obtaining a greater knowledge of Jesus Christ, and he has an attitude of unrestrained abandon and total surrender about him. The Holy Spirit is determined that we will have the realization of Jesus Christ in every area of our lives, and He will bring us back to the same point over and over again until we do. Self-realization only leads to the glorification of good works, whereas a saint of God glorifies Jesus Christ through his good works. Whatever we may be doing— even eating, drinking, or washing disciples’ feet— we have to take the initiative of realizing and recognizing Jesus Christ in it. Every phase of our life has its counterpart in the life of Jesus. Our Lord realized His relationship to the Father even in the most menial task. 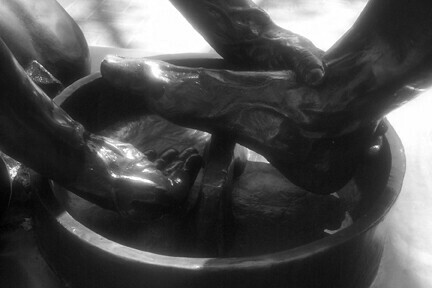 “Jesus, knowing ... that He had come from God and was going to God, ... took a towel ... and began to wash the disciples’ feet ...” (John 13:3-5). The aim of a spiritually vigorous saint is “that I may know Him ...” Do I know Him where I am today? If not, I am failing Him. I am not here for self-realization, but to know Jesus Christ. In Christian work our initiative and motivation are too often simply the result of realizing that there is work to be done and that we must do it. Yet that is never the attitude of a spiritually vigorous saint. His aim is to achieve the realization of Jesus Christ in every set of circumstances."